imagine a Windows®-based SOE image inspired by automation. imagine an enterprise-class service at small business prices. imagine you didn't need any infrastructure or specialized technical knowledge. impeltec brings to you the world's first and only self-service SOE Portal, a Software-as-a-Service (SaaS) platform for creating your SOE images in the cloud. The SOE Portal allows you to design, build, maintain, and even deploy your Standard Operating Environment (SOE) without having to invest in infrastructure or specialized technical resources! Want to deploy to your devices direct from the cloud? Ask us how! The service outputs a low cost, standardised, reliable SOE image that will meet your needs whether you are a small-medium business, enterprise or government organisation. Our approach results in a single image that can be installed on all your hardware models, and caters for your differing business units or regional needs. The SOE Portal automation also makes your SOE image maintenance and change demands a breeze, no more stressing or guessing about how to incorporate the latest hardware certification, update a core application, or make a configuration changes. Best of all is the ongoing time and cost savings your business will realise. The SOE Portal provides you with a subscription-based cloud service that gives you the flexibility to choose a plan that best suits your organisation. Our subscription plans are designed to reduce resource effort and associated SOE lifecycle costs when compared to current day SOE practices, providing real year on year dollar savings to your bottom line. Dedicated infrastructure is not required, providing savings on hardware and associated support and licensing costs. Expensive or dedicated skilled resources are no longer required. Check out our pricing, or contact us for help with calculating your ROI. The SOE Portal build automation currently supports Windows® 7, Windows® 8.1, and Windows® 10. Need virtual? 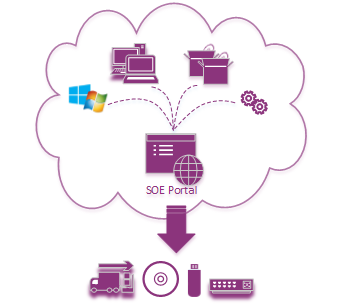 The SOE Portal is equally capable of provisioning both physical and virtual devices. Couple this service with impelApp and impelDeploy to have all your end user management needs covered. See our services overview to discover our full range of SOE-related services. If it's SOE consulting you're after, impelSOE is what you need.